Guess who I've been hanging out with! 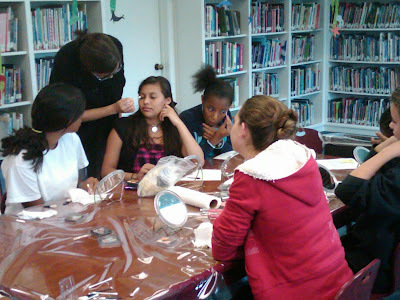 The event at the Rancho Santa Fe library on Monday was FANTASTIC! Librarians Debbie and Sylvia really did a GREAT job getting it organized and advertised. And what a brilliant idea to bring in a makeup artist! Muchos thank-yous! The library is kind of tough to find because there are several lookalike buildings in the same parking lot. Luckily, Child #4 spotted these girls as they exited their vehicle. 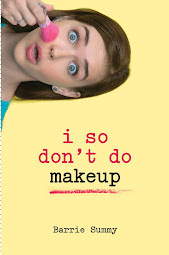 One was clutching a copy of I SO DON'T DO MAKEUP. We followed them in. Thank you girls, I might still be wandering around that crazy parking lot if it weren't for you! 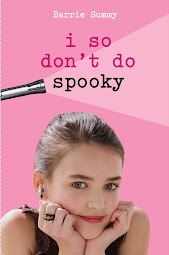 Look at this BEAUTIFUL artwork based on I SO DON'T DO MAKEUP! 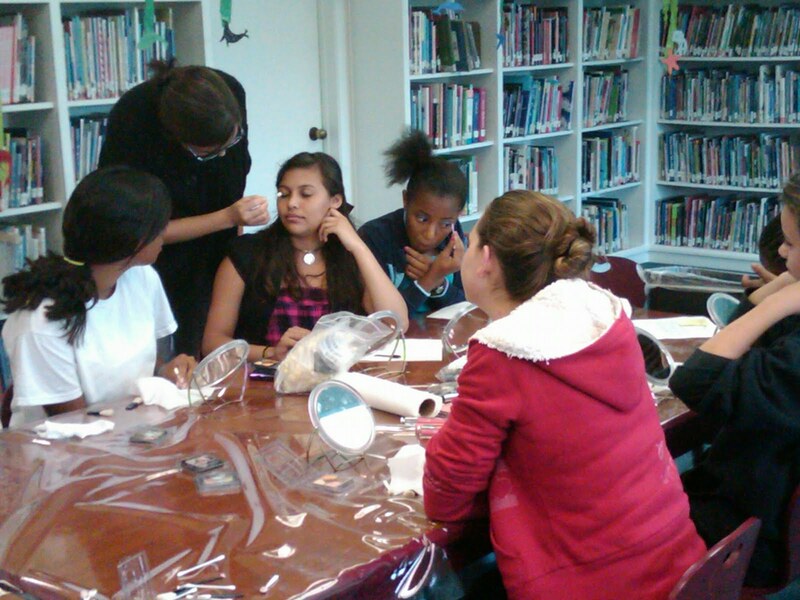 Here's Meilani , makeup artist extraordinaire, helping girls get dolled up. Child #4 may have used up most of Meilani's sky-blue eye shadow! The Rancho Santa Fe Public Library rocks! And...And...And....our little mama veiled chameleon is tunnelling in the five-gallon Home Depot flower pot on the floor of her cage. Yup! 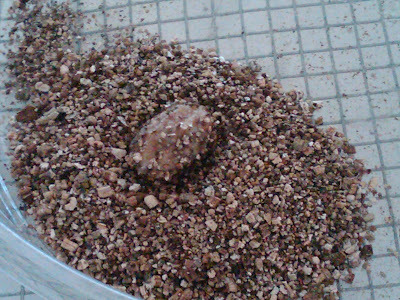 She's digging a hole to lay another clutch of eggs! Just to bring you up to date: we currently have 83 eggs in incubators. The first 50 should hatch in the fall. I took this photo a while ago. I didn't dare snap a shot of her today because I don't want to interrupt her whole birthing process. If she doesn't lay her eggs, she dies. Yes, you read that right! SHOE trees. It all starts with one person lobbing a pair of shoes up onto a high branch. Apparently, it's easier to get the fad going if you choose a tree close to the side of a road where there's a convenient spot to pull over. People often write messages on their shoes before sending them sailing into a tree. No doubt about it, though, shoes are tough on trees. The shoes and boots weigh down branches. The footwear gets even heavier with rain. Some people take photos and document the life cycle of shoe trees. There are about 70 shoe trees in the U.S., most of them on the west coast. Here are locations of a few shoe trees in California: Big Bear, Ludlow, Joshua Tree, and last, but certainly not least, my very own BALBOA PARK IN SAN DIEGO (how have I missed this?!). Now, I haven't actually visited any of these shoes trees. But I'll definitely be down in Balboa Park this summer. And I could probably fit in a sidetrip to see a shoe tree or two during a vacation or a water polo trip. Or . . . I could start my own shoe tree in the backyard. After all, I have four kids. That's eight feet. And just think of their enthusiastic friends! There are people who compare our shoe trees with the rag trees of Britain and the Middle East. People hang rags on special trees or on trees near holy places (such as a holy well) for healing or good luck. To ensure fertility, a bride and groom may tie one of her shoes with one of his and toss the combo into a shoe tree. Roadside America is always on the lookout for tips about shoe trees. 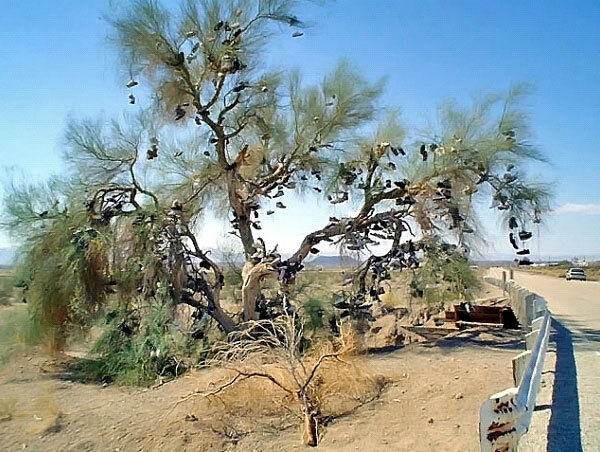 The tree must sport at least 50 pairs of shoes, be easy to get to, and have the reputation with the locals as a shoe tree. If you've put up a MTM post, please let this week's hostess with the mostest, Clare2E, know by leaving a comment on the Women of Mystery blog or on the official My Town Monday blog. BTW, Clare has a great MTM post on the Women of Mystery blog about Seoul, Korea. Look at this sad veiled chameleon egg. It's covered in mold. I removed it from the deli dish where it was hanging out with a bunch of its friends because I don't want the mold to spread to other eggs. I set the moldy egg in its own dish and left off the lid, in the hopes of drying it out. But, I basically think it's a lost cause. 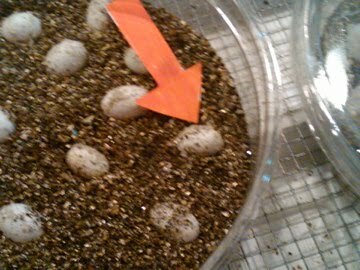 :( You can add humidity if an egg/eggs are is/dry and shriveling. But we've never successfully removed mold. Still, it doesn't hurt to try. The remaining eggs in that dish are white and plump and healthy looking. Fingers crossed they stay that way! So, we're down to 83 eggs. In similar news, Child #2 jumped into the pool yesterday with his cell phone in his pocket. First cell phone death of the summer. This coming Monday (June 28) at 1:00, I'll be at the Rancho Santa Fe Public Library (107040 Avenida de Acacias, Rancho Santa Fe, CA 92067, phone: 858-756-2512). 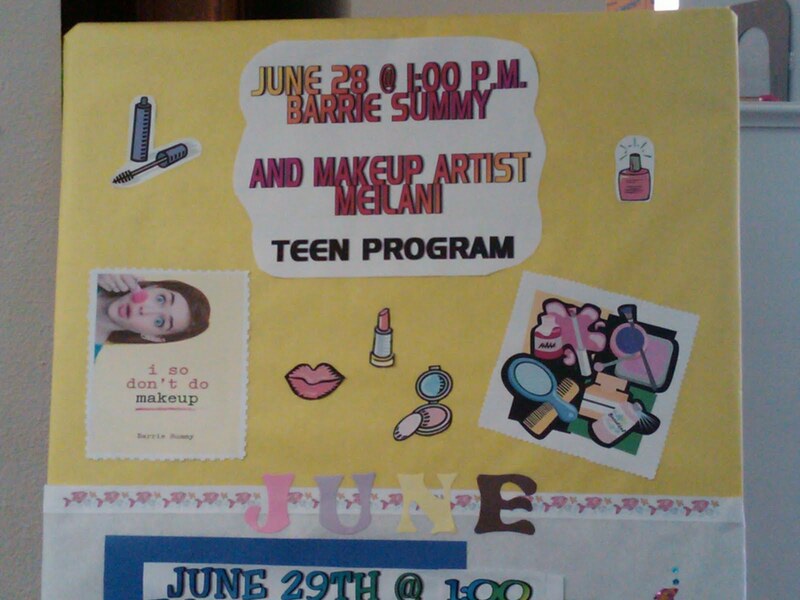 There will be a makeup artist. There will be giveaways. There will be me, chatting. Also, I will happily sign any books you bring (or win). Should be a blast! 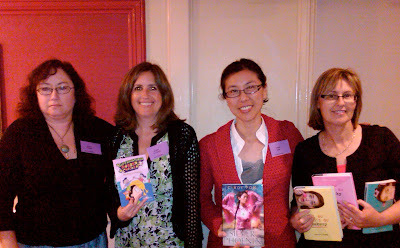 Last Saturday, I was on a very fun Young-Adult panel with (left to right) Laura Preble, Debra Garfinkle, and Cindy Pon. It was at Romance Writers of America--San Diego chapter. Our topic: Writing Young Adult. It's like writing for adults. Only different. I had a great time. I loved being on a panel with three brilliant YA authors! I loved the RWA audience! I loved having lunch served to me! Tomorrow is the last day of school for my children! Yippee! Welcome to another My Town Monday! This is the last week of school for my high schooler, my middle grader and my fourth grader. And in San Diego, this means Hello Beaches! Because we have, uh, SEVENTY MILES OF BEACHES! The Travel Channel calls Coronado one of America's best beaches. A couple of times a week, Child #4 and I drive Child #3 to long-course swim practice at Coronado High School. Given the length of the practice and the distance this school is from our home, Child #4 and I ARE FORCED to spend the evening on Coronado. 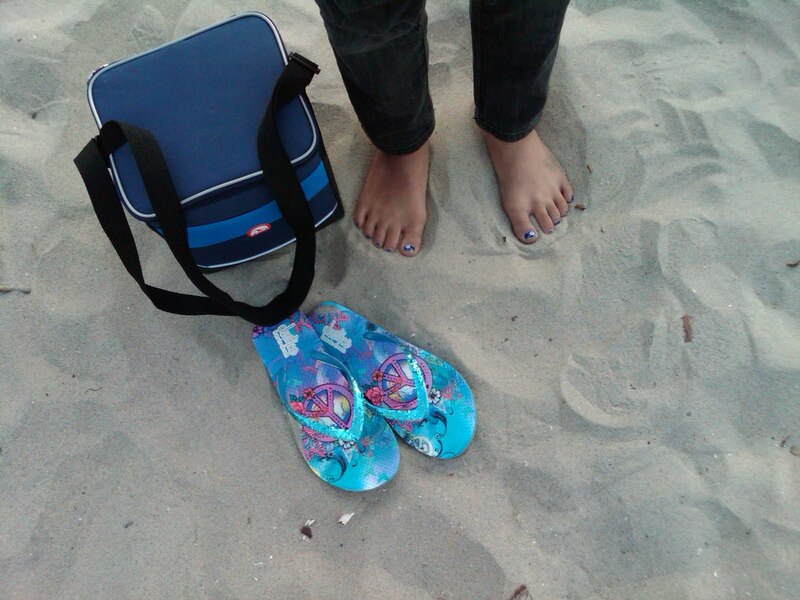 We generally wander down to the beach with a picnic dinner. 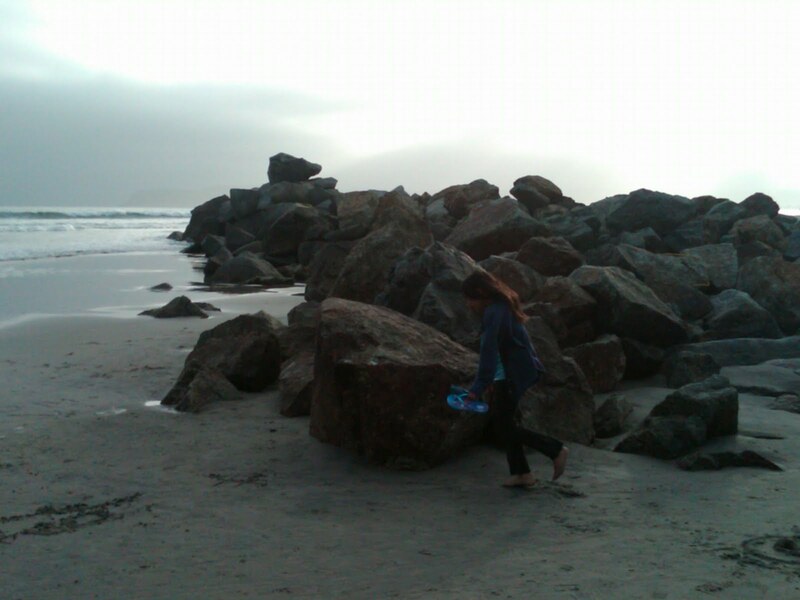 Here's Child #4 climbing on the breakwater. There was originally a scene on this very breakwater in I SO DON'T DO MYSTERIES, but it got cut. Eventually, Child #4 and I hit Spreckels, the candy store located under the Hotel del Coronado. 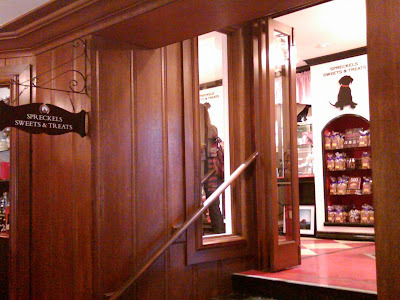 A scene in this candy store was added to I SO DON'T DO MYSTERIES. Travis Erwin of One Word, One Rung, One Day: posts from Amarillo, TX about, uh, meat. Gabe of Gabe's Meanderings: posts from Winnipeg, Manitoba about the Harte Trail. Welcome to MTM, Gabe! J. Winter of Edged in Blue: posts about how to take a honeymoon in downtown Cincinnati, Ohio. 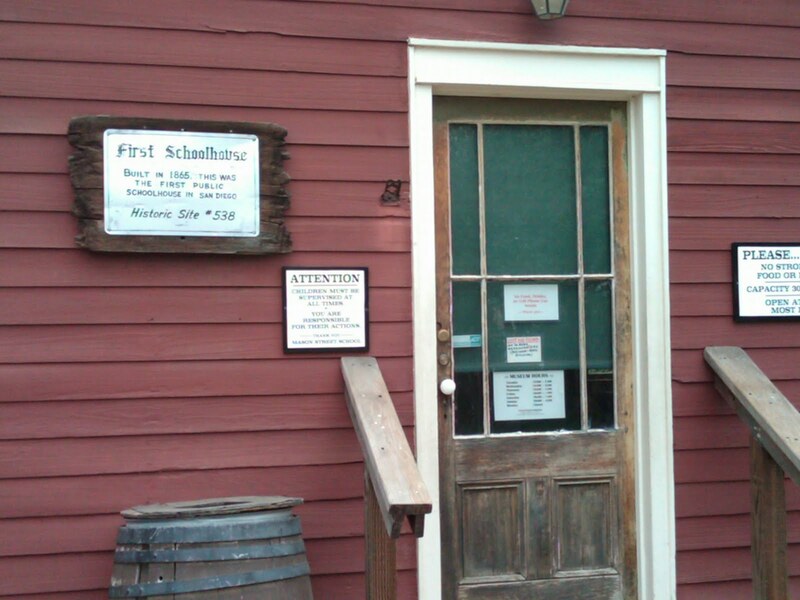 Debra of From Skilled Hands: posts from Peninsula, Ohio about Mr. Lincoln's visit to her town. 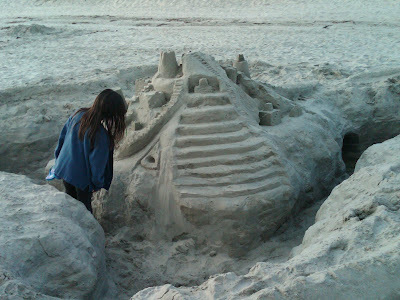 Patti Abbott of Pattinase: posts from Detroit, Michigan about her town's Passport to the Arts. This week, I'm the hostess with the mostest for My Town Monday. So, if you've put up a MTM post, let me know in the comments section here or on the on the official My Town Monday blog. (Thanks Clair!) I'll link to you here and on the MTM blog. Thanks also to Travis Erwin for getting the whole My Town Monday ball rolling. Happy Monday! Dazzle your dad or someone else's dad or, well, anyone with the following Father's Day Trivia! 1. Which came first? Father's Day or Mother's Day? 3. Who thought up the idea of Father's Day? 4. Why is Father's Day celebrated in June? 5. What flower is associated with Father's Day? 6. About how many dads are there currently in the U.S.? 7. About how much will be spent on Father's Day cards in the U.S. this year? 8. What is the most common Father's Day gift? 1. Mother's Day, by far. Way back when, the Egyptians were celebrating Mother's Day. 3. In 1909, a woman named Sonora Smart Dodd wanted her church to celebrate Father's Day. Her father had raised her and her five siblings following the death of her mother. 4. Because June was Sonora Smart Dodd's dad's birthday month. 5. 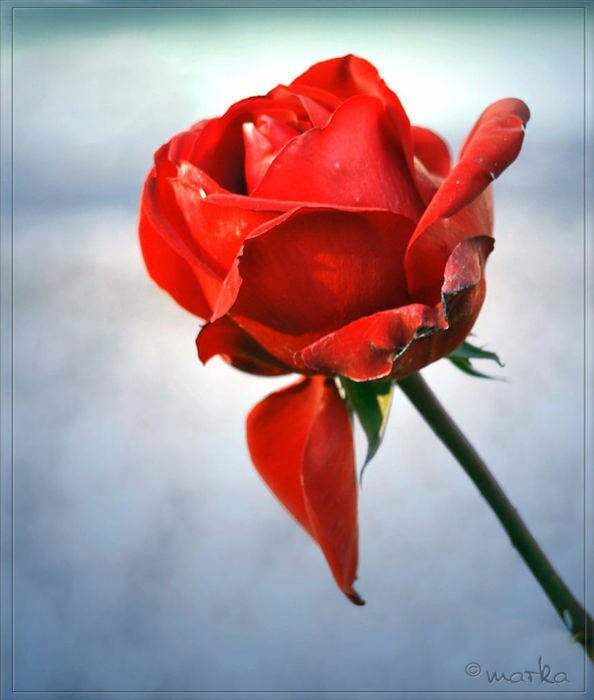 The rose. Wear red if your father is still alive and white if he has died. 7. About $100 million. 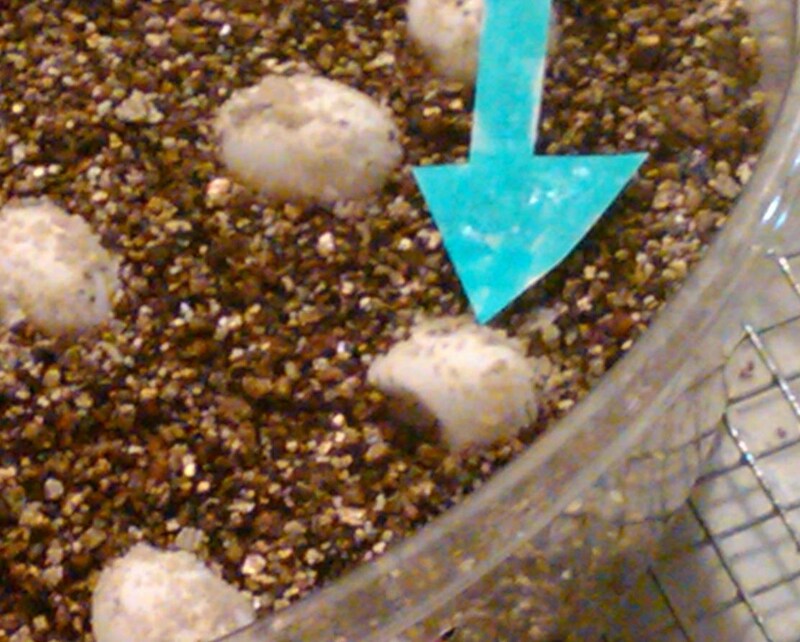 Father's Day is the fourth most popular card giving day in the U.S.
You may recall that we have two clutches of veiled chameleon eggs in our incubators. 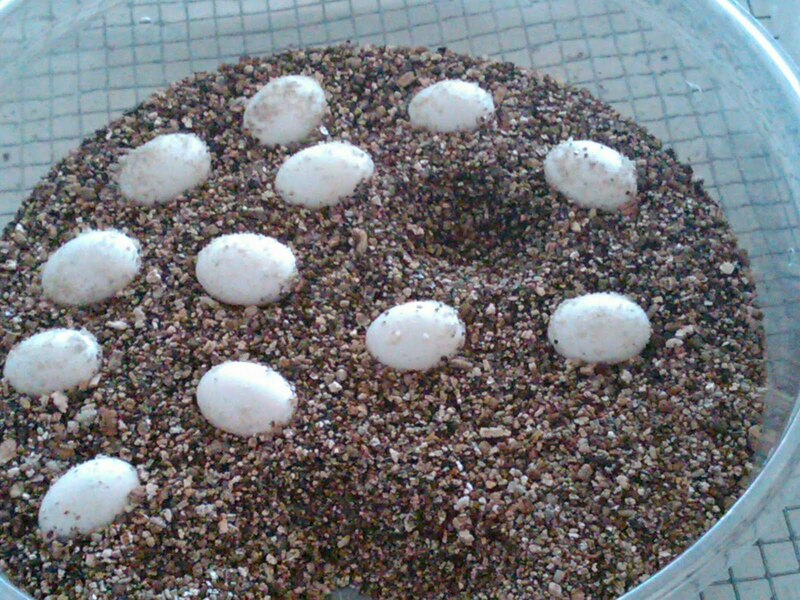 The first clutch of 51 eggs was laid near the end of February. The second clutch of 33 (larger) eggs was laid near the end of April. You may also recall a discussion in our house where Mr. Summy and Child #2* expressed a desire to turn over all, or at least half, the eggs to the pet store for hatching. But I, a huge lover of challenges, wanted to try hatching the eggs at home, despite past failures. Because it would've been my job to transport the eggs to the pet store, the eggs are still in incubators in my kitchen! At the risk of jinxing the entire operation, I'm here to report that ALL the eggs are still going strong! This is longest we've gone without losing any eggs. In the past, eggs have shriveled up or gone moldy! It's tough to keep the humidity just right in the incubator. An egg is starting to shrivel, collapse in on itself. Syringe + bottled water to the rescue! 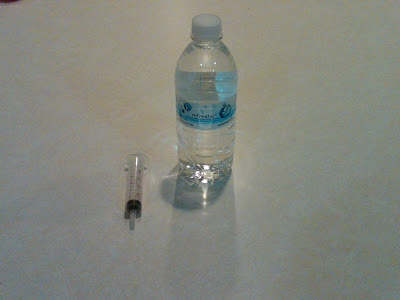 I dribble water from the syringe tip INTO THE SOIL AROUND the shrivelling egg, making sure to never get the egg itself wet. Ah....all is right with the world. The egg all plumped up again. Sometimes it takes a couple of hours for the egg to absorb the water. Sometimes a couple of days. We used to spray around the eggs in trouble. 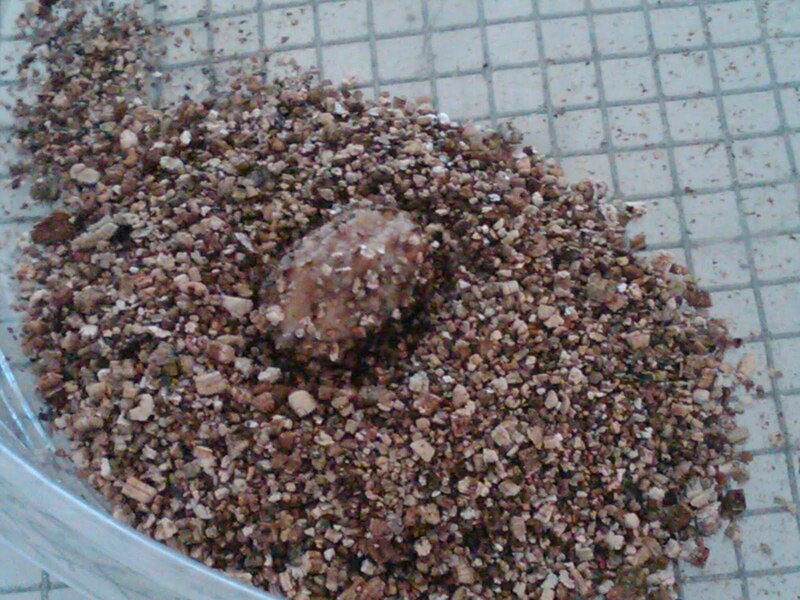 Now, I'm injecting the soil around the egg with water. 2. I'm draping a tea towel over the little window in each incubator. This keeps it darker in the incubator. 3. I'm "cooking" the eggs at a lower temperature--below 80. Yes, yes, I'm obviously getting into this hatching business just a little too much! But I can't help myself! 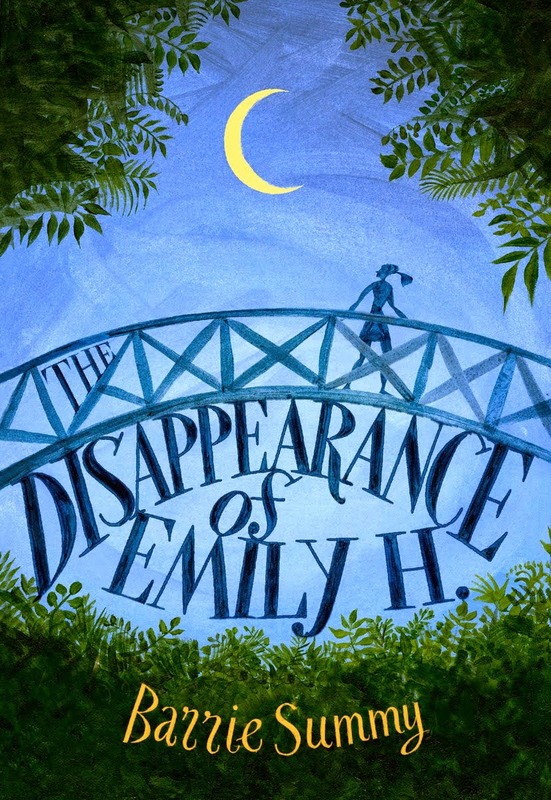 Have you been wondering where I disappeared to? Mostly just catching up on life. I handed I SO DON'T DO FAMOUS back in after another round of revisions. And I've been hanging out with friends, going on school fieldtrips, doing a couple of school visits, reading a bunch, defrosting my freezer. Like I said, just catching up. However, it's Monday. And you know what that means: My Town Monday posts! 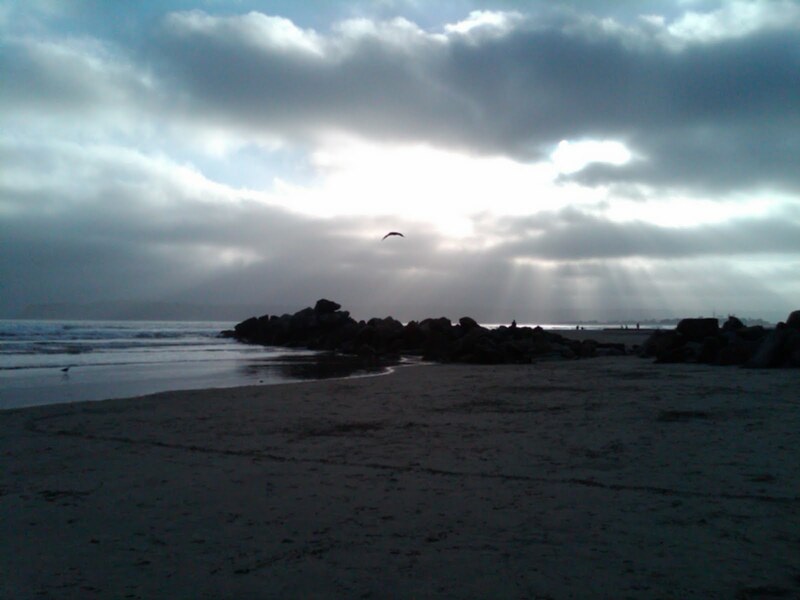 Down here in San Diego, we're approaching that most waited-for day of the year: the last day of school! 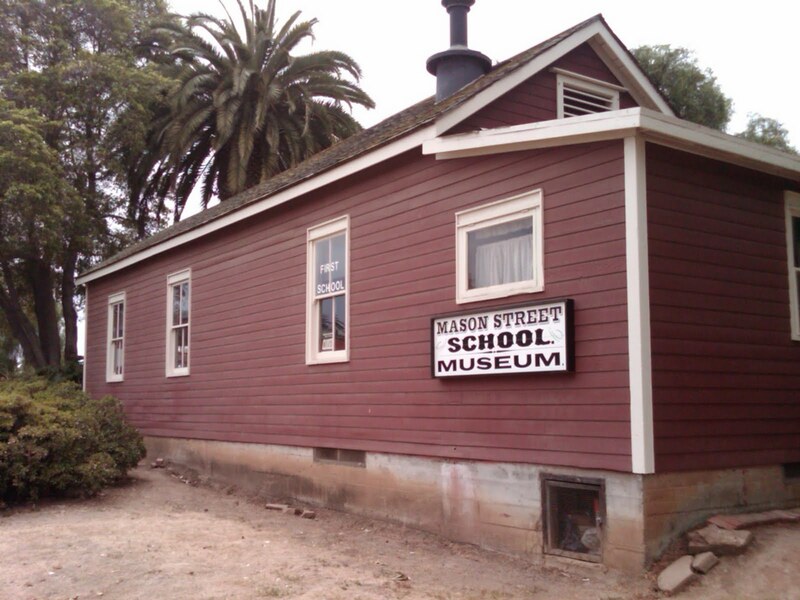 What better time to bring you San Diego's first public schoolhouse! Mason Street Schoolhouse is located in Old Town. The school was built in 1865 of uneven boards salvaged from torn-down buildings. The first teacher was Mary Chase Walker who was paid $65/month. On April 1, 1865, Miss Walker took a four-month steamer ride from New York to San Francisco where she was unable to find a teaching position. She heard there was an opening in San Diego and headed our way. My school was composed mostly of Spanish and half-breed children, with a few English and several Americans. I aimed to teach which was most meaningful to them; namely reading, spelling, arithmetic, and how to write letters. At recess the Spanish girls smoked cigaritas and the boys amused themselves by lassoing pigs, hens, etc. The Spanish children were very irregular in their attendance at school on account of so many fiestas and amusements of various kinds. For a week before a bull fight the boys were more or less absent, watching preparations, such as fencing up the streets leading to the plaza. Miss Walker had about 35 students, ranging in age from 4 to 17 years. Students were rarely on time as few families owned a clock. The one-room schoolhouse was heated by an iron stove and was open for business 9am to 4pm, 12 months a year. Attendance plummeted to 15 after she invited a black woman to lunch, and Miss Walker ended up resigning over the controversy. She had been teaching at Mason Street for 11 months. Shortly thereafter, Miss Walker married the president of the school board, Mr. Morse. She became involved in the suffragette movement. She lived in San Diego until her death in 1899. Oh yeah, and it's free to enter. Inside, you'll find the original seats and desks. Links to other My Town Monday participants are here on the official My Town Monday blog or on Travis Erwin's blog. Travis is this week's MTM host (thanks Travis!) and has an interesting post involving bones and the Texas Panhandle. Lastly, please consider joining My Town Mondays. We'd love to hear about your neck of the woods. If you do throw up a MTM post, let us know at one of the links in the above paragraph. Welcome, welcome one and all to the EIGHTEENTH meeeting of our Book Review Club. Eighteenth! According to Wikipedia, if we were awarding ourselves a gift for 18 years of marriage, it'd be something turquoise or porcelain. So...grab a porcelain mug, fill it with the best coffee we could afford, choose a cupcake decorated with turquoise sprinkles and have a seat. We've got some great book reviews for you! In honor of Child #4 who turned ten this past weekend, I'm reviewing a book I picked up a little over 9 1/2 years ago in Seoul, Korea when I traveled there to bring her home. 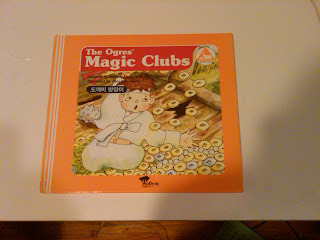 Actually, I picked up several of these folktale books. There are two tales per book. Each is told in both English and Korean. What do I love about these folktales? 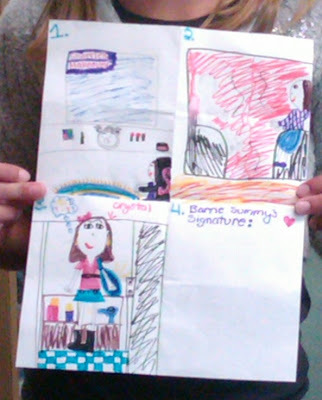 The pictures. AND you never know what twists and turns the story's going to take. A folktale from another country is a peek into its culture. Priceless. In The Ogres' Magic Clubs, a young man, who thinks first of his parents' and his brother's welfare, happens upon a group of ogres in a cottage. He spies on the ogres and observes them whacking the floor of the cottage and singing, "Gold, gold, come ye forth! Oh, silver, come ye out!" A bunch of gold and silver flies out from wherever the ogres whack. Totally by accident, the young man scares away the ogres. Then he steals all the gold and silver and one of the magic clubs. Now, he's a rich man. Enter the older, greedy, lazy, less respectful brother. You didn't see that coming, did you? Anyway, he finds the same cottage, observes the same ogres and their cottage-whacking ritual. UNFORTUNATELY, the ogres spot him, think he's the man who stole their magic club, and they proceed to whack him "as hard as they could" with their clubs! They beat him "over and over" and eventually they let him leave. He goes home "sore but wiser." Here's the last line of the story: "And he never went back to that shack in the woods again." Oh, you say, thanks a lot. 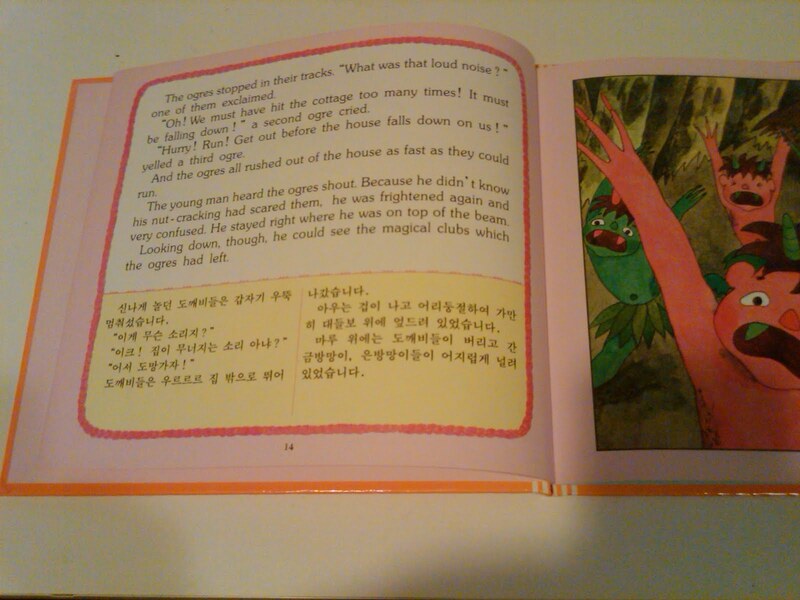 Get us all excited about Korean folktales that we can't even get our hands on. Wrongo. If you go to amazon.com, type in "Korean folktales," a bunch of these books pop up. Quite incredible. And now, drum roll, onto the amazing reviews from amazing reviewers!! Please, please visit. You won't be sorry.